Dean Cummings on NBC affiliate KSDK television. 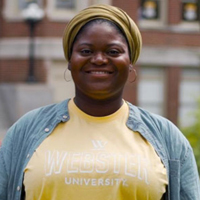 Two Webster University students were featured with Simone Cummings, dean of Webster’s George Herbert Walker School of Business & Technology, in a segment on NBC affiliate KSDK (Channel 5) about what graduates should be doing to find a job. 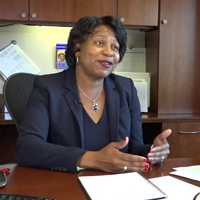 "Those four years are going to go really quickly and when they do we want our students to be ready," said Cummings. So how can you be ready? Be sure to get experience in your field before you graduate. Be sure to network, network, network. Never be afraid to ask for help. "What we recommend is that students join professional organizations, they use LinkedIn, they connect with our alumni network," she explained. The full story, “You just graduated college. Now what?” can be viewed online here and originally aired at 6:30 a.m. on Thursday, May 24. New Webster alumna Beatrice Gibson is being honored by the Schnucks Folds of Honor project this month for Memorial Day. Some of Gibson’s photography is currently on display in the May Gallery, and she is featured by Schnucks as a recipient of a Folds of Honor scholarship. The scholarships aid students who are children of a parent killed or wounded in military service. Beatrice's dad, Ronald Gibson, was a United States Army sergeant in the Vietnam War. While attempting to save a comrade, he fell head first out of a helicopter. It was determined that because of this devastating fall, Ronald Gibson developed Parkinson's disease. Once a great athlete and soldier, today he has trouble getting around and even speaking. But Beatrice says he is tremendously proud of her receiving her diploma this month. Read the full profile of Beatrice here. 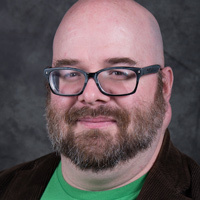 Remy Cross, associate professor and chair of Anthropology and Sociology in Webster's College of Arts & Sciences, was quoted in a story in the Webster-Kirkwood Times about civilian advisory boards for police. The story is part of coverage of the latest Alliance for Interracial Dignity meeting, where Cross spoke on the topic. Cross told attendees the key to effective citizen advisory boards lies in long-term buy-in from all stakeholders. "Advisory groups are a process, not a checklist. Setting them up is neither a marathon or sprint. It's a lifestyle change," he said. Cross shared highlights of best practices learned from organizational behavior and security-oriented city models learned in the past five decades. He said what's currently happening in America relates back to the late 1960s. He referenced efforts from the Community Oriented Policing Services (COPS) national initiative. "COPS introduced the concept that officers must be willing to focus on residents' quality of life in professional ways, meaning, what is wrong in people's daily lives and community, and not just on what is criminally wrong," he said. Read the full story in the Webster-Kirkwood Times. Why does Webster's Global Marketing & Communications pitch media opportunities that connect reporters with Webster University faculty experts? Because their knowledge is of interest to reporters, and when they appear in news stories it helps raise awareness for them, their academic programs, and Webster University as a whole. 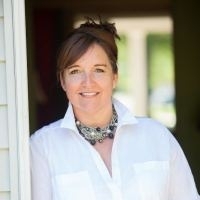 Julie Smith, visiting instructor in the School of Communications, was recently interviewed by the Canadian Company Experts Finder for its "Expert Spotlight" about media literacy, her research and her numerous interviews by media in the past year. "She is current and relevant. Her affable nature make her a solid interview for stories on fake news, parenting features, the impact of social media, and media literacy. She has been interviewed by USA Today, the Washington Post, NPR, USA Today, and numerous regional outlets." Read the full profile of Smith here.